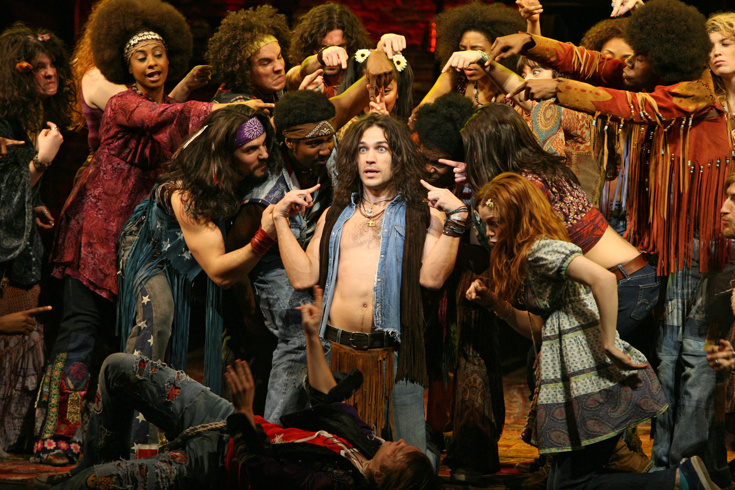 Will Swenson & the company of Diane Paulus' 2009 Broadway revival of "Hair"
NBC has passed on the Age of Aquarius. The eagerly anticipated live TV presentation of the groundbreaking rock musical Hair has been removed from the network's schedule. The live musical event had been announced to take place on May 19. "Live musicals are a part of this network's DNA and we are committed to continuing that tradition with the right show at the right time," said Paul Telegdy and George Cheeks, Co-Chairmen, NBC Entertainment. "Since these shows are such enormous undertakings, we need titles that have a wide appeal and we're in the process of acquiring the rights to a couple of new shows that we’re really excited about." Tony winner Diane Paulus, who helmed the Tony-winning 2009 Broadway revival of Hair, had signed on to co-direct the small-screen musical alongside Alex Rudzinski. Neil Meron and the late Craig Zadan, who had shepherded each of NBC's live musicals since The Sound of Music revived the programming genre, were originally announced as executive producers on Hair Live! The most recent musical to air on television, Fox's presentation of the gritty Pulitzer winner Rent, garnered the lowest ratings of recent small-screen musicals to date.